Russell Walters stood by the Kennebec River. A proposed hydropower line would cross over the Kennebec River Gorge. THE FORKS, Maine — The broad, endless sky, curving over the vastness of the deep woods. Stillness broken only by the whooshing of white water and the squawks of wildlife. This is what drew Kevin Ross to the North Woods. But the grid finds even the most secluded places, it seems. Central Maine Power wants to run a new transmission line through more than 50 miles of the North Woods, the largest undeveloped forest east of the Mississippi River, to deliver Canadian hydropower to Massachusetts. The prospect of power lines marring the landscape has stirred deep concerns in The Forks, a rustic town of about 40 full-time residents at the confluence of the Dead and Kennebec rivers. The $950 million project would carve a 145-mile path from the Quebec border that would run across the Appalachian Trail three times and over the Kennebec River Gorge, the region’s crown jewel. Ross opposes the plan. But many of his neighbors have come to back it, if reluctantly. In exchange for their support, the company has promised to lavish The Forks and neighbors — small towns that have struggled economically for years — with tens of millions of dollars. Kevin Ross in West Forks, Maine. Many residents consider those payments bribes, and worry that the pledged money is pitting neighbors against each other. At the same time, they recognize the need for economic aid to offset declining tourism. Until recently, Central Maine Power’s proposal was considered an also-ran to a similar plan in New Hampshire, called Northern Pass, the initial choice of Massachusetts Governor Charlie Baker’s administration to import clean energy. But in February, New Hampshire regulators rejected Northern Pass, saying it would despoil the White Mountains and hurt tourism. In March, the Baker administration announced it would instead negotiate an agreement with Central Maine Power for 1,200 megawatts of hydropower, enough to power roughly 1.2 million homes. The administration had solicited the proposals to comply with a 2016 state law that requires Massachusetts utilities to buy additional renewable energy to cut earth-warming carbon emissions. Officials at Central Maine Power, a subsidiary of the energy company Avangrid, acknowledge that their plans call for power lines to extend through environmentally sensitive areas, saying the route is necessary to avoid a patchwork of conservation lands where development is banned. But they’ve pledged to minimize the impact of the new lines and have launched a well-funded campaign to build support throughout the state. Many environmentalists have expressed skepticism about the plan, which calls for the clearing of a 150-foot-wide path and about 1,000 large support structures. But proponents and company officials say the project would reduce carbon emissions across New England, and would sharply curb Maine’s energy costs. It would create about 1,700 new jobs during construction and generate an estimated $18 million a year in new property taxes, while improving the reliability of the state’s electricity grid, they said. “We respect what Massachusetts is trying to do to change New England’s energy future and address global climate change,” said John Carroll, a spokesman for Central Maine Power. Rafters sped through part of the Kennebec Gorge last August. 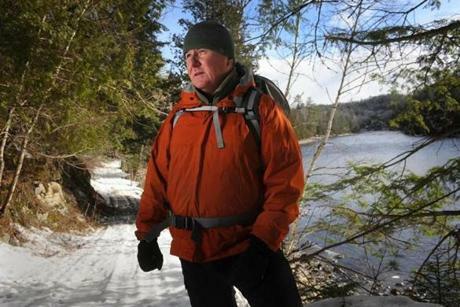 In addition to promising millions of dollars to groups in The Forks area, Central Maine Power has pledged to spend $50 million over 40 years on programs to assist low-income communities, and to reroute the Appalachian Trail so that the project would be less intrusive. The company has also offered to bury the power lines beneath the Kennebec Gorge, an expensive option, but says the money could be put to much better use, from building new trails and visitor centers to marketing local businesses. Carroll said the company has received support from nearly all of the 29 communities adjacent to the power lines, which would extend from the Canadian border in northwestern Maine to a substation in Lewiston. But environmental advocates question whether the project, which the company hopes to complete by 2022, would actually reduce carbon emissions. They worry that Hydro-Québec, a province-owned company that would generate the electricity from its immense system of 63 power stations, would divert the hydropower from elsewhere, requiring those areas to rely on dirtier fossil fuels. The Baker administration should seek the additional renewable energy from solar and wind-power projects instead, producing more jobs and keeping more money in New England, advocates said. The project has made allies of some environmentalists and fossil fuel companies, whose representatives say the plan could undermine existing power plants in Maine by deepening a glut of electric supply. Officials at Hydro-Québec dismissed claims that there would be no overall reduction in carbon emissions. The company has been planning to export additional hydropower to New England for years, and all of Quebec’s electricity comes from its hydropower, said Lynn St-Laurent, a spokeswoman for Hydro-Québec. “We can commit to delivering more to Massachusetts — during every month of the year — all the while doing the same in all our other neighboring regions,” she said. Walters showed visitors the area where a plan brings new high-voltage transmission lines across the pristine Kennebec Gorge. In The Forks, Russell Walters said he has come grudgingly to support the project. The president of Northern Outdoors, the largest rafting company in Maine, Walters said he would prefer that power lines don’t arc over the Kennebec Gorge, where his rafts pass through regularly. He laments the clear-cutting that would be required if the project secures the three state and two federal permits it needs. 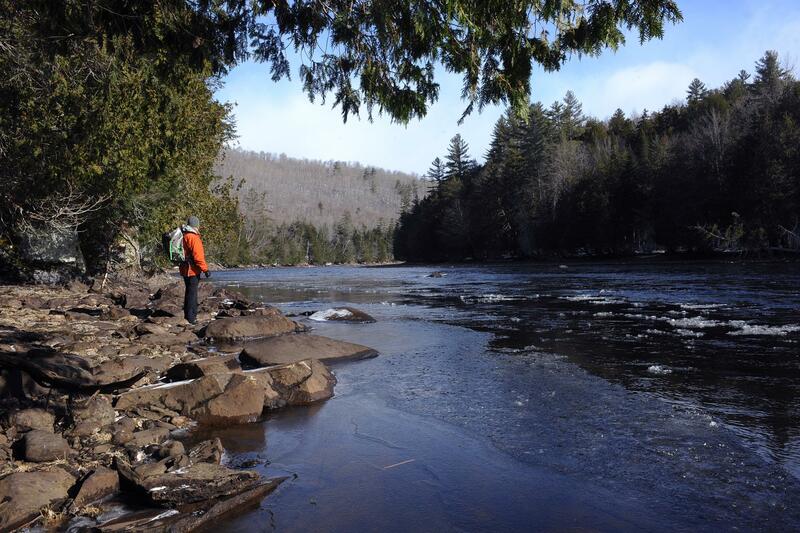 On a recent hike along the frozen banks of the Kennebec, Walters gazed at the flowing water and surrounding snow-covered hills. “This is peace,” he said. But Walters’s company has been struggling in recent years. Like others in the area, it’s for sale, as the number of rafting customers has fallen by nearly half since 2000. With that in mind, Central Maine Power’s lucrative offer seems too good to pass up, he said. That doesn’t sit well with many of Walters’s neighbors. While getting a coffee at Berry’s General Store, Andy Webb said he considers the power lines to be scars on the horizon and insists they aren’t worth the money. 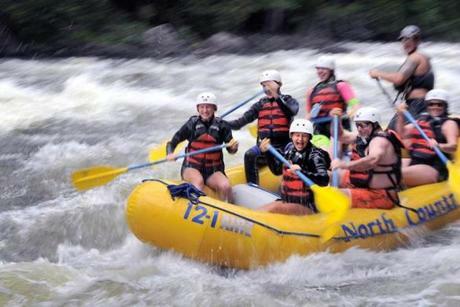 Still, he empathizes with the owners of the rafting companies. 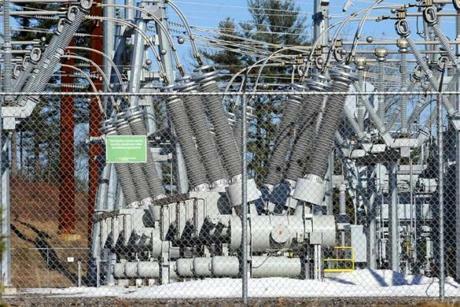 Central Maine Power’s Larrabee Road substation in Lewiston would be where new high-voltage transmission lines would connect Hydro-Québec to the New England power grid.